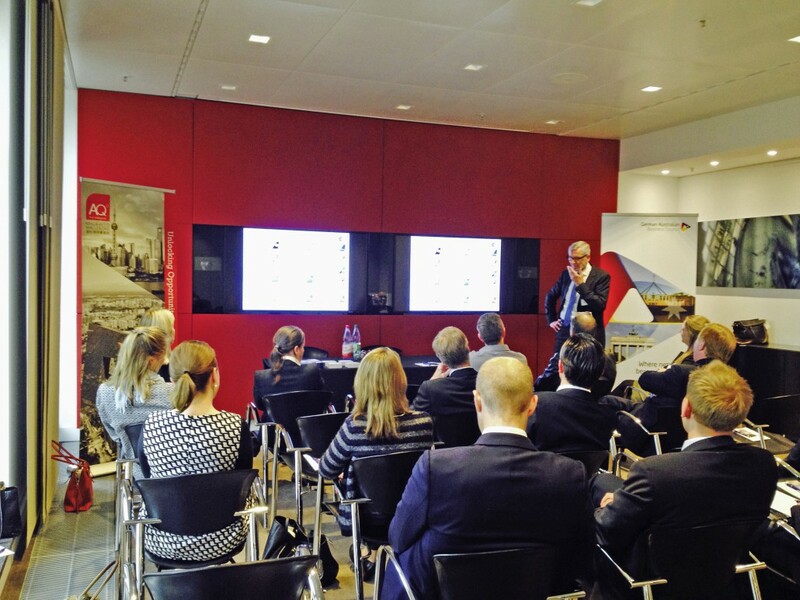 On May 27 2015, we kicked off our leadership series in Frankfurt with Phil Douglas, Australian entrepreneur, CEO and founder of the German company, 2e Systems. Following a welcome speech from Catherine Stephen from the German Australian Business Council, Phil launched into an entertaining and insightful look into the growth of his business. From his humble beginnings as a freelance Lufthansa consultant to founding his own company and becoming an industry leader in online and mobile technologies for the global aviation industry, the company can now boast 75 employees spread over 5 international offices today. 2e Systems’ success story was interwoven with Phil’s humorous and at times surprisingly honest anecdotes, earning him an extremely captivated audience. As 2e Systems continues to grow and face new challenges Phil gave us all a positive perspective on leadership in a dynamic and demanding market. Following Phil’s speech, there was networking amongst members with a delicious buffet, Australian wines and beer. Special thanks to our Corporate Member, King &Wood Mallesons, for hosting this event at their offices.